Queen Lil'uokalani was born on the 2nd of December 1838 and died on the 11th of November. Queen Lil'uokalani was the first Queen of the Hawaiian Monarchy but the last Hawaiian Monarch. She became Queen at the age of 53 after the death of her brother King Kalakaua in 1891. It was very hard for her to rule because of American pressure. She even tried to write a new constitution but was unsuccessful. 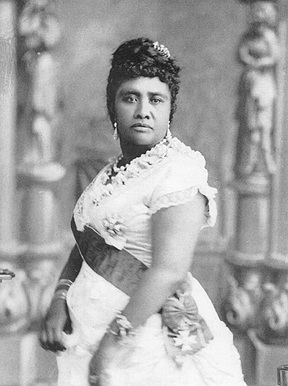 In 1893 American troops invaded Hawaii and took Queen Lil'uokalani away from her throne. A temporary Government was put in to place with Sanford Dole as President. Queen Lil'uokaliani and her hawaiian people tried to revolt but after ten days of fighting she was arrested and was charged with treason and she was held prisoner in her own palace in a small room. In 1896 she was released and asked the president for help but he said he could do nothing. This is a performance of the original Aloha Oe performed in front of Iolani Palace.